Finally I got around putting my two Konig Reasons 15" rims up for sale on eBay. 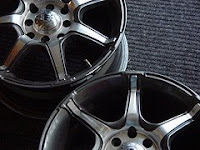 I got them back in 2006, new, after an unfortunate fishtail that cost me two of the Konig Heliums that came with the car. Took me half a year or so to replace the Heliums (got them on sale, too), and the two odd wheels have been sitting in the shed packed up since. My new Azenis are here!